MaxxCAT has created a new breakthrough database technology: dbWARE (Write Anywhere, Read Everywhere). An elegantly simple solution to a complex synchronization and reliability problem. The Enterprise Class db-8000 dbWARE database appliances utilize breakthrough database technology: dbWARE (Write Anywhere, Read Everywhere). 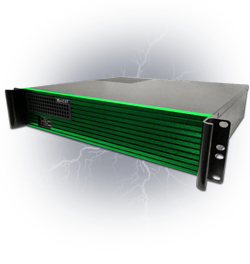 These extreme performance, high availability database replication appliances are designed for large enterprises with geographically separated user bases. Fastest database appliances in the industry, capable of writing mySQL over WAN, faster than the native databases can write over a LAN. This amazing performance puts us at the forefront of database technology.